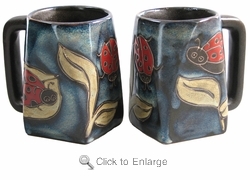 This Mara Mug 12oz with the Square Bottom features cute Ladybugs on a plant leaf. The Ladybug is a favorite insect of gardeners. This Mara Coffee Mug would make a great gift choice for the gardener in your life. You can see all Frog, Insects and Turtle Designs here Frog, Insects and Turtle Designs. You can also check out our Mara Mugs 16 oz Round Bottom here Mara Mugs 16 oz Round Bottom.